Warehouse Resealed items are in perfect working condition. Opened for store display. Comes with original packaging, and full manufacturer warranty. The 4-channel 96kHz/24-bit soundcard streams all audio signals with no loss of sound quality – and being Traktor Scratch Certified, the DJM-900nexus unlocks DVS control. DJs can connect one USB cable and control Traktor with Timecode CD and/or vinyl, directly through the mixer. 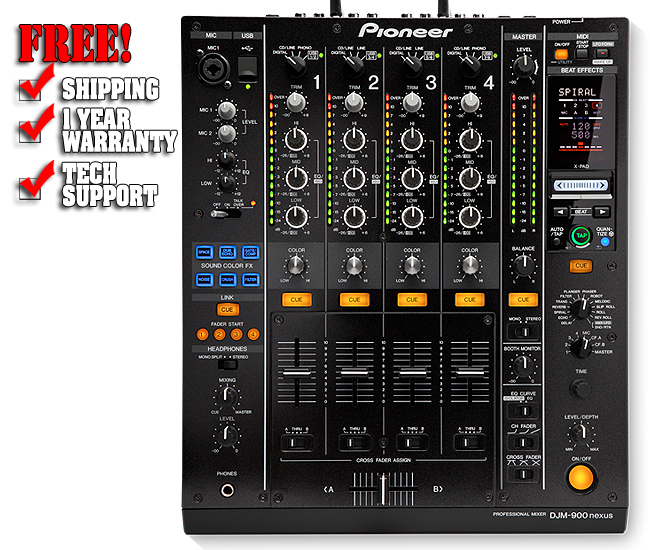 6 stunning studio-quality Sound Color FX expand upon the previous 4 and add extra dimensions to any DJ set. With a dedicated FX processor for each of the 4 channels, it raises the bar once more. An overhauled Beat Effects section further enhances the potential for mind-blowing arrangements: 5 new effects, a revolutionary level of control and Pioneer simplicity will rival any other system. The new built-in X-Pad brings instant one-finger Beat Effects performances. Users of the CDJ-2000 and CDJ-900 can hit the DJM-900nexus Quantize button to lock all these new effects to the Beatgrid of the playing deck. The DJM-900nexus layout is the industry's most intuitive, most widely used and most creative. With the new plug-and-play software connection that makes DJ transition a breeze, the result is a next generation mixer that is ready for professional DJ booths the world over. Engineered to bring studio quality sound and sequencer style tricks to the club, six new beefed-up effects turn creative vision into a reality at the twist of a dial. In addition to the essential FILTER and CRUSH, the DJM-900nexus boasts four new modern effects. The massively popular Noise from the DJM-2000 is added by popular demand. The brand new and seriously lush Space reverb brings high-pass and low-pass ambiance to every channel. The new Dub Echo also has high-pass and low-pass control over a new tape delay effect to twist with your mind as you slip the timing. The amazing Gate/Comp strips back your music to the peaks, or beefs it up to seamlessly blend drastically different productions together in the mix. rekordbox™ Quantize picks up Beatgrid data over the ProDJ Link. Simply connect the DJM-900nexus to the network and compatible CDJs send real-time BPM and beat position data to the effects, even as you adjust and bend the pitch in the mix! In addition to the Beat buttons that change the timing, the intuitive X-Pad is a touch-sensitive strip that simultaneously engages the Beat Effects, while adjusting things like the Reverb filter, Roll time, and Phaser LFO - using just one finger! Bringing a new approach to Filter, Phase and Flanger sweeps is a twin LFO. LFO1 is controlled by the Beat buttons, while LFO2 expresses further wobble factor using the X-Pad. New fader technology and fader caps will make the DJM-900nexus last for even longer. These include Reverb, Spiral, Slip Roll, Melodic and Midi LFO. The DJM-900nexus joins the Pro DJ Link family with a LAN connection that brings three revolutionary new features: Now On Play, Beat Effects and Cue Link. TRAKTOR™ users can connect their PC to the mixer via a single USB port – conveniently located on top of the unit - to get direct input from Traktor's 4 decks and enjoy all of its features. The DJM-900nexus is equipped with the same high-quality audio input and output circuits as the DJM-2000. New fader technology and fader caps will make the DJM-900nexus last for even longer between services in super-tough club environments. High performance channel faders – The slide mechanism supports the fader knobs with two metal shafts for both longevity and smooth operability Furthermore, the new mechanism’s design minimizes the effects of moisture or dust particles on the mixer’s performance capabilities. Indicators – The DJM-900nexus is equipped with a “USB connection indicator” to display the status of sound card and PC or Mac communications as well as a "USB audio input indicator" to display audio inputs from a PC or Mac. Industry’s First MIDI Signal Output8 – The DJM-900nexus features the industry's first musical instrument digital interface (MIDI) signal output that changes at beat-by-beat intervals. The mixer also includes a "MIDI LFO function" to control external devices such as effecters. Switching 3-Band EQ/Isolator – Each channel of the mixer is equipped with a switchable 3-band EQ (+6dB to -26dB) and 3-band Isolator (+6dB to -8dB).